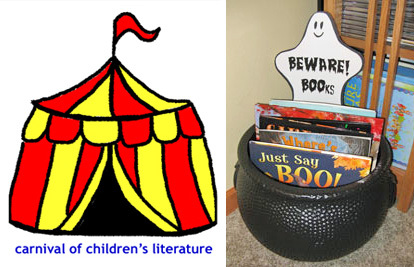 Welcome to the October Carnival of Children's Literature! What's brewing in the blog world of children's books? The cauldron is bubbling over! Read on to find oodles of books and posts on a multitude of topics. 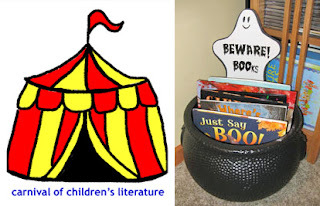 For those not familiar with the Carnival of Children's Literature, it is a monthly round-up of submitted blog posts about children's literature. The carnival is hosted at a different blog every month. Find out more and/or participate in the carnival at Anastasia Suen's Booktalking. Wondering about the cute cauldron pictured over to the right? -- It contains my family's collection of Halloween books. I borrowed the book cauldron idea from Obseussed after seeing it on Pinterest. The Picture Book Review introduces the picture book, Asiago by Adam McHeffey. Tiffa, a fellow stay-at-home mom recently enjoyed the book with her son and says, "Asiago is a great book for young children. It has a vampire theme that will mesh well with Halloween without being all about Halloween. This book deserves more attention and more readers." Storied Cities recommends a picture book she discovered by accident, The Trip by Ezra Jack Keats. According to Erica, "This is one of the few Halloween picture books with an urban setting. It's also one of Keats' lesser known titles (or so I believe)." The Adventures in Writing & Publishing featured a series of posts in October called 13 Lucky Days of Halloween Reviews. 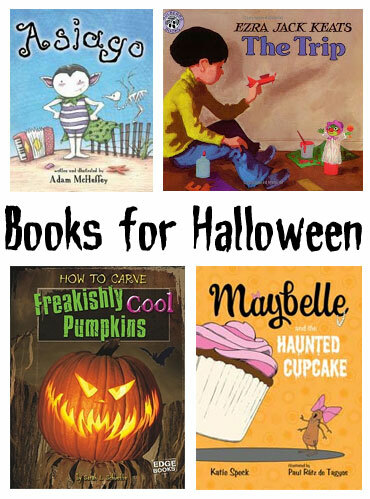 There's a wide assortment of spooky, fun books for a range of ages. One of Lisa's posts is about a non-fiction book by Capstone Press, How to Carve Freakishly Cool Pumpkins by Sarah L. Schuette. 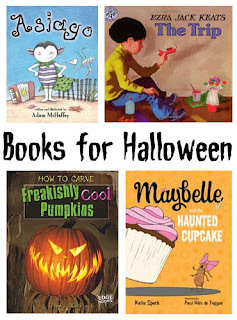 The Cath in the Hat reminds us that Halloween is just around the corner with her review of an enticing short chapter book (also a CYBILS nominee), Maybelle and the Haunted Cupcake by Katie Speck, illustrated by Paul Ratz de Tagyos. Monkey Poop is back to blogging with a review of Ugly Fish by Kara LeReau; illustrated by Scott Magoon. It's a "kooky picture book" that her 2.5 year old finds hilarious. Flowering Minds offers a must-read for inquisitive minds -- The Great Paper Caper by Oliver Jeffers. Darshana says this picture book is, "a quirky, imaginative introduction to the “whodunit” genre for young readers with a message of conservation, recycling, and forgiveness." 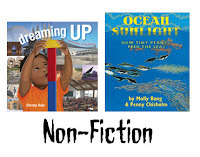 Stacey Localzo changed her mind about books containing speech bubbles after reading a book perfect for early readers or a reader who has yet to discover they love reading -- A Trip to the Bottom of the World with Mouse by Frank Viva. "The simple text, picture support and graphic style all make for a winning selection." True Tales & a Cherry on Top reviews Magritte's Marvelous HAT by D. B. Johnson. Jeanne comments, "The book is inspired by a real person -- the surrealist artist Rene Magritte and the author imagines Rene Magritte as a dog in his surreal world. Author, D.B. Johnson says, 'You try on a hat that floats in the air and leads you to a place where anything is possible and everything is impossible.' And how impossibly wonderful is that?!" NC Teacher Stuff reviews a neat-looking new book, Infinity and Me by Kate Hosford; illustrated by Gabi Swiatkowska. Jeff sums it up -- "Infinity and Me is a terrific fiction picture book about a girl who ponders the concept of infinity. The text and the artwork will help students better understand this concept." Brimful Curiosities introduces a fantastic robot book, BOY + BOT by Ame Dyckman; illustrated by Dan Yaccarino. "Simply and perfectly told with bold, eye-pleasing illustrations, this is quite possibly the best robot picture book we've ever read (and believe me, we've read several)." Plus, Janelle and son show off their stellar robot building skills by constructing a BOT out of LEGOs. Little Hearts/Gentle Parenting Resources provides a list of 25 Must-Have Books for Preschooler Bookworms. Her list includes many favorites including Go Away, Big Green Monster, Harold and the Purple Crayon, If You Give a Mouse a Cookie and some more unusual recommendations like Light Up the Night (a book my own preschooler enjoyed this summer). Horribly Humorous History for Kids presents an intriguing post this month discussing 19th century alphabet books for kids. "ABC books can be a snapshot of the kinds of pictureable objects that would have been familiar to kids in times past, and some of the pictured objects are, well, shocking to our modern eye." Sarah's post titled, N is for Nylghau, also shows how ABC authors handled the letter X, in the era before X rays were invented. Wrapped in Foil shares a book for little architects -- Dreaming Up: A Celebration of Building by Christy Hale. This is a new, nonfiction picture book that "pairs illustrations of children building with common materials and an intriguing shape poem about the process with amazing photographs of actual structures from around the world." 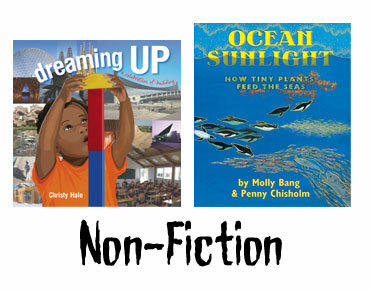 SimplyScience Blog reviews Ocean Sunlight: How Tiny Plants Feed the Seas by Molly Bang and Penny Chisholm, a "lovely book explains ocean food chains and the source of energy that runs them--phytoplankton." Playing by the Book shares a modern-day fairy story, Operation Bunny by Sally Gardner, illustrated by David Roberts. Zoe writes, "Operation Bunny is a beautifully written and very funny book for fluent young readers about fairies, detectives and a talking cat. We also made our own miniature fairy wings to go with the story." 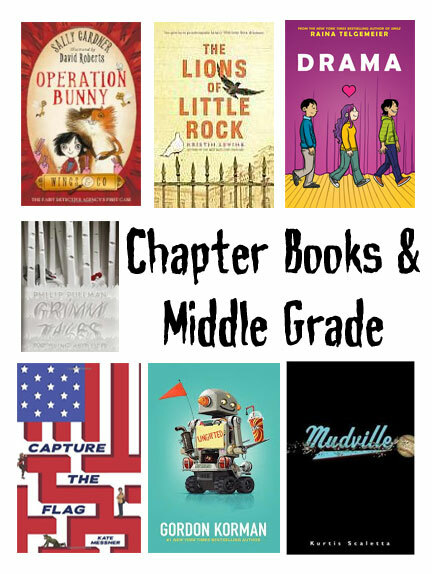 Shelf-employed reviews a middle-grade graphic novel, Drama by Raina Telgemeier. The book is "written in “acts” rather than chapters" and "Telgemeier breaks new ground in introducing gay characters to a novel for younger readers (ages 10 and up)." Geo Librarian reviews an amusing and touching middle grade book, Ungifted by Gordon Korman. The author "demonstrates that while not all students have academic talents, everyone has something to add to the school environment." Yellow Brick Reads reviews Philip Pullman's much-anticipated adaptation, Fairy Tales from the Brothers Grimm: A New English Version. To mark the 200th anniversary of the publication of Children's and Household Tales by the Brothers Grimm, Pullman has rewritten 50 out of the original 211 tales. Great Kid Books reviews Every Day by David Levithan. 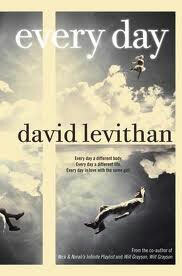 Mary Ann writes, "I was absolutely fascinated by David Levithan's new book EVERY DAY. It raises questions about identity, memory, relationships in a way that will appeal to teens. I call this realistic fantasy - it is definitely fantasy, but one that will appeal to teens who like realistic fiction." No Water River welcomes everyone to Poet-a-Palooza. 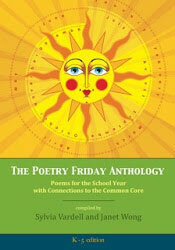 Join in a celebration of the publication of Sylvia Vardell and Janet Wong's important classroom poetry resource, The Poetry Friday Anthology. The post includes an interview with Janet and Sylvia as well as poetry videos by Jane Yolen, Ken Slesarik, Stephanie Calmenson, and Michael J. Rosen. Teaching Authors -- April Halprin Wayland, talks about her struggles finishing a novel she's been working on for 14 years. She also shares her related original poem, "Patience." Barbies on Fire interviews children's book author Darcy Pattison and reviews her latest book, Desert Baths. "The book explores the unusual bathing rituals of many animals living in the American Southwest. It's a great book filled with continuing education resources for those curious about desert critters." Booktalking goes behind the scenes and talks to Margaret Quinlin, editor (and publisher) of Carmen Agra Deedy's lastest book, Return of the Library Dragon. 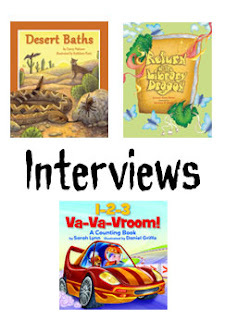 Picture Books & Pirouettes interviews picture book author Sarah Lynn. The interview highlights Lynn's publications experiences, which range from iPhone Apps to traditionally published books, and offers advice for aspiring authors. Sarah Lynn's newest book is 1-2-3 Va-Va-Vroom! A Counting Book. A great carnival round-up. It good to see you in the blogosphere again! This looks terrific! Thank you for your work. Thank you for hosting a great carnival. I can't wait to check out these wonderful reads. Thanks for hosting! I can't wait to dig in! Lovely posting! 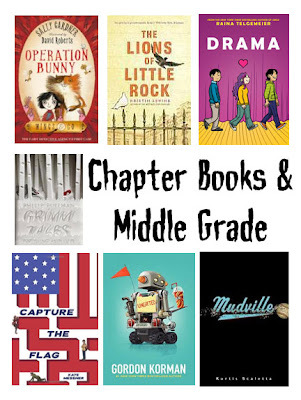 Thanks for taking the time to list out books by category and to include snapshots of the book covers. Wonderful job. Love this list, the organization of all the books. Thanks for putting in the time to do this!We must pick up some of these books! we just finished A Mango in the Hand by Antonio Sacre it was so good for my little ones just learning to read.If any of you have read it I would love to hear what you thought! we picked it up at antoniosacre.com! Thanks again for taking us to the "Carnival"! What a lovely carnival! Thanks so much for hosting, and for including the link to our TeachingAuthors post. What a great group of book reviews! Thank you for including Little Hearts Books/Gentle Parenting Resources. Sharing! Thanks for hosting the carnival. Looking forward to looking around!